The most VD, ladyboys, streetwalkers, old farang drunks, criminals, scammers, pickpockets, necklace and purse snatchers, Russians, Indians, and Africans per square meter. So safe to assume you have not been yet but received your knowledge from the experts on Thai visa? Yes, it is pretty typical of people who have not been here. It is like those that say: If you walk down any street in Angeles City you will get robbed or shot. When asked the answer is usually; No I have never been but I heard. If you love Pattaya, she will love you a hundred times more. And do not consider the Russians bad.Russian himself.There are savages, but they are in any nation. Also, more to Pattaya than bar stools. Perhaps the younger crowd do not spend much time on bar stools? Being young, they might walk. And, some of the older crowd (me), also do not spend much time (none) on bar stools. But bangkok beats them all in quality and looks by miles. Yet you tell me to go to Pattaya to get laid ?? Well you certainly need to go somewhere to get laid. Your angst is palpable. Or do you "love" your dog long time? Another Pattaya wanna-be weighs in. Clearly hasn't been here any time in the last few years or he wouldn't have made the statement regarding Pattaya Beach. The last few years it has been clean and now, with the beach replenishment, it's beautiful and wide the whole length. Never seen a rat so that's not been a problem. Fat, poorly-dressed people? Well, as an American, I am used to that and have seen far worse at any outlet mall in the US. Spending part of the time in Bangkok, I can say that Pattaya is no worse than Bangkok in cleanliness. So, to sum up, I have the other poster's numbers 1-5. Plus, a now great beach, no rats on me, average amount of trash and average amount of over-weight, poorly dressed people. (A plus in my book because they make me look even better.) Keep dreaming. All garbage - Why just make that up ? I live in Pattaya and concur completely with the post you replied to. Did you come to Pattaya, 5 months ago to get laid? Sounds like you need another visit. I will accept a beating by expats from Bangkok but I draw the line at those from Nakhon Nowhere. Which explains I guess why you're a bit obsessed with getting laid by the things that parade through Pattaya. I guess its reputation is just coincidence. Don't beat yourself up about it - horses for courses. Which makes me wonder, why visit a place you thought was a 'dump', only to find that it is 'still a dump', according to you. Why keep visiting? 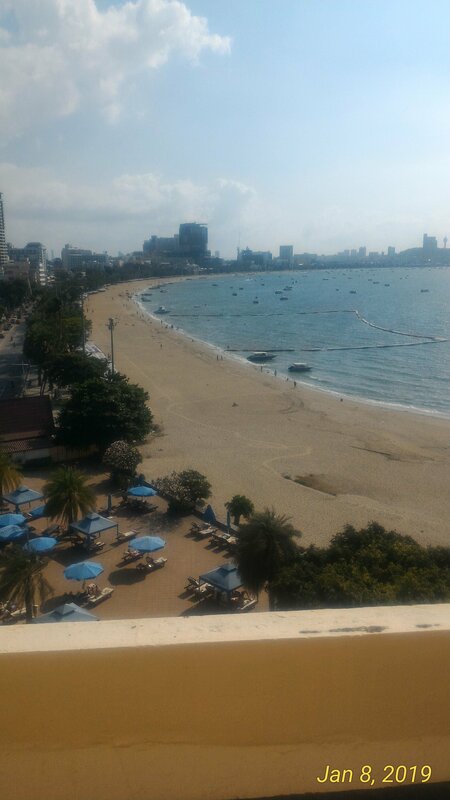 By the way, here's a pic of Pattaya Beach, which I think you said was sh**tiest in the World, or something like that. You might be the one making things up. The place is an unplanned mess, a sewer in place of the sea, a rubbish tip for a beach and a traffic nightmare. It floods in the rainy season, stinks in the dry season and is full of people you would never wish to see, meet or ever socialise with. Dead? here's hoping. I think you should say how you really feel about the place .. not hold back. Last time I checked it was not compulsory to visit Pattaya. Dont like it .. dont go there. We dont all move in your high end circles. Us people you dont want to meet or socialise with are really gutted. PLEASE change you mind. Off to the Opera tonight are you ? Or is it Bridge at the golf club. Jeez wish I had your class. I gonna have to make do with scantily dressed temptresses dancing whilst Im trying to concentrate on my beer. Its so boring here. But I like all them cute smiles and laughter .. thats just the old falang. Where is your posh classy bit of Thailand and life style .. rhetorical question .. I dont care. You know alot about it .. describing the different seasons. Must have been here quite a bit. Could not have been toooo bad or were you held captive. What is the HIV capital now? Last I heard it was Rayong - many sailors stop there. I think Pattaya is getting healthier since a lot of people from a certain country have left.